To the world of wine at your fingertips - any time, every time. The tradeagrape community is made up of Everyone; who you choose to Follow; and who or what wine is Nearby. Both exploring and drinking the world of wine is now possible! Wines to your Cave and let the tradeagrape community what you have. These wines are your currency to trade for wines you want. For the wines you want! You can find your Facebook friends here too, as well as choose people you’d like to Follow, like sommeliers, or wine makers. Narrow your Search even further and Filter by Vintage, Variety and/or Region. With the in-app IM to chat with fellow winos, and find out more about wines you’re interested in, or wines you don’t know about yet. All trade offers, acceptances, rejections and cancellations also live within the IM pages, so you can easily see all of your messages and trading activity with each trading partner. We’re a trading place where you will find wines you want. We’ve unlocked the wines of the world by virtually lifting the roof off the countless bottles in peoples cellars, stacked in boxes, at off site storage, or even under the cool stairs. tradeagrape provides all access to every possible wine, is the only hub where you can source, secure & offer, and without having to buy more. No waiting lists, no allocations, and no rules or boundaries to getting the wines you want. Wine is currency after all. It's time to drink more wine! 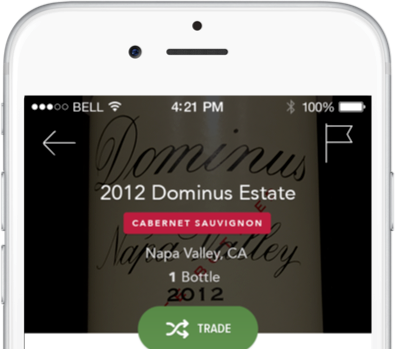 Upload some bottles on tradeagrape now and get those oenophiles, your friends and work mates to load bottles as well. The more wines, the bigger the bounty for us all to cheers and enjoy! If you love wine, you’ll love this.